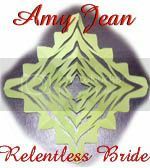 "It amazes me just how prolific Amy Jean is. She will be there to comment on your blog be it a well known high traffic or a small back lot one. This snowflake reminded me of her amazing tenacity to visit and comment on so many blogs to make someones day with the different repeating facets. On yeah you should also check out her blog The Relentless Bride as she's always got some amazing ideas." Hooray for Amy Jean! Your comments always make my day, too. I agree with everything Sabrina said. That is so sweet. . .and true. You faithfully make comments. Ditto! Ditto! Ditto! Congrats Amy~ you deserve every one of those kind words!